Accurate Patient Monitoring in the palm of your hand. Specifically designed for veterinary use featuring veterinary specific software with enhanced sensitivity. Advanced signal processing technique is ideal for patient motion and low perfusion cases, as well as applicable for spot checks or continual monitoring during procedures. 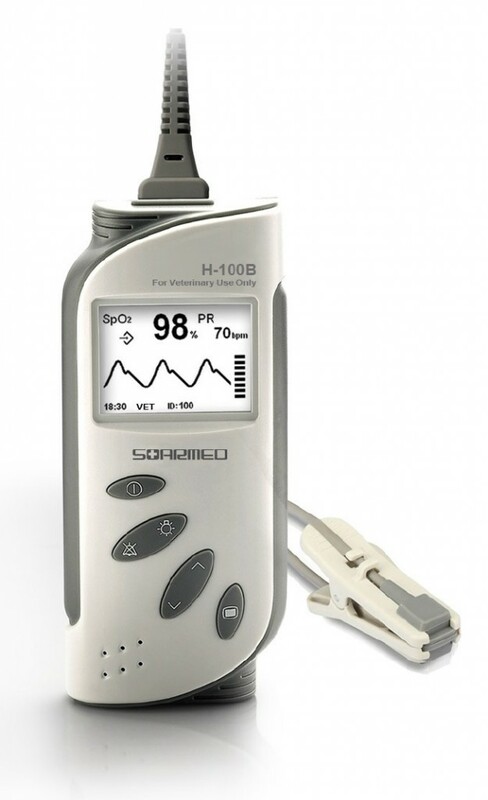 H-100B is lightweight and portable with a bright LCD display which shows SpO2, Pulse Rate and waveforms. It accommodates 300 hours of data storage which can be transferred to a PC for storage, management, review and printing. Assessing a patient’s need for oxygen is the most essential element to life. The Edan VE-H100B Pulse Oximeter is an accurate, affordable and easy to use pulse oximeter. Large numeric and Waveform display with Real Time Clock, Perfusion Index (PI) Bar, Trend Graph and SpO2 Pulse Review Table. Simple buttons are conveniently located for ease of operation. Backlight switch and automatic power-off function saves power.